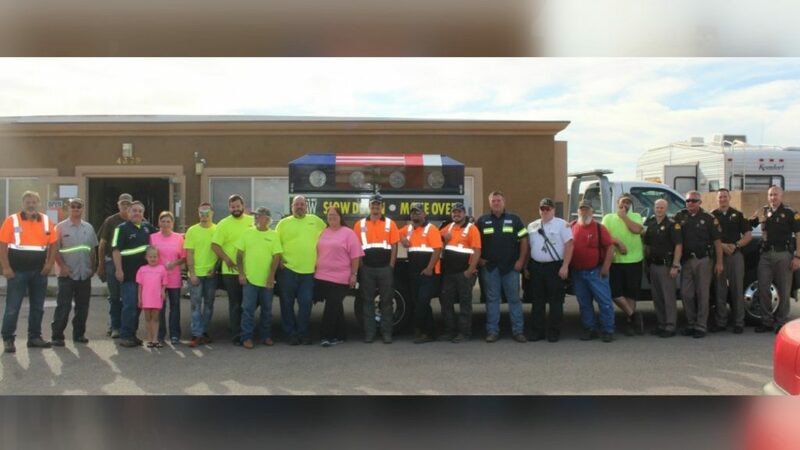 SOUTHERN UTAH — In honor of those who have made the ultimate sacrifice while working “the white line,” a ceremonial casket made its way through both Washington and Iron counties Friday as part of a procession that began in New York and continues across the country aimed at reducing the staggering number of deaths for those working along the nation’s roadsides. 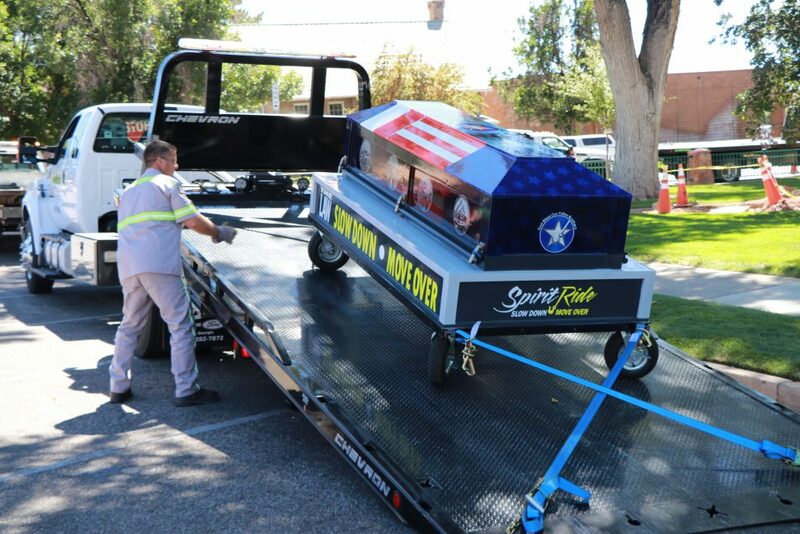 In Washington County, Freedom Towing hosted the Spirit Ride event at 9 a.m. at its facilities on South Progressive Drive where a specially designed casket was loaded onto one of the company’s tow trucks to begin the procession through St. George. 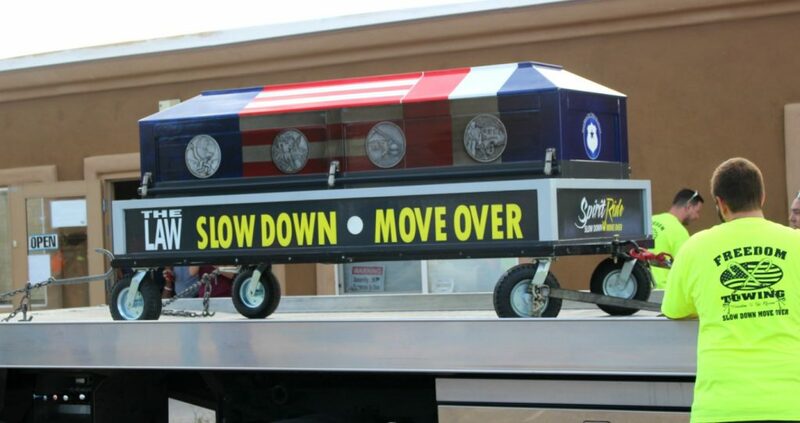 The casket reflects the dangers first responders and tow operators face on a daily basis. Against a backdrop of deep colors to inspire a somber tone, it featured red stars to symbolize a blood sacrifice, while blue stars signify the loss of family and white stars to honor the spirit of the fallen. 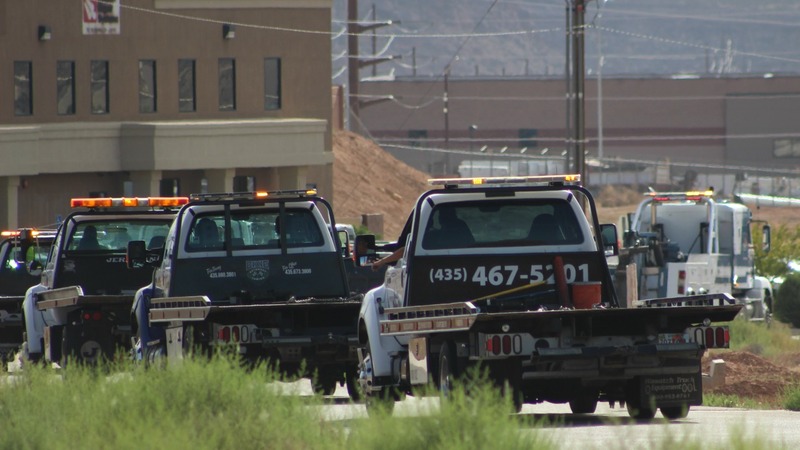 The procession of more than 20 tow trucks from numerous towing companies was escorted by four Utah Highway Patrol troopers as it made its way along Interstate 15, River Road, Bluff Street and St. George Boulevard. 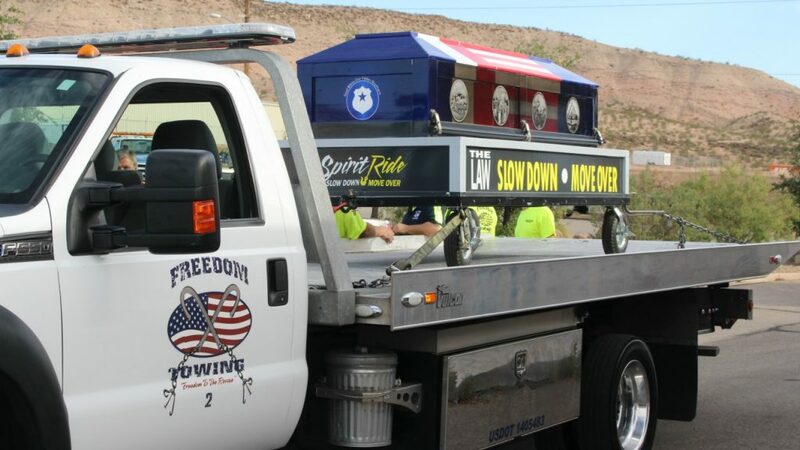 For Freedom Towing owner Sterling Norton, the goal to raise awareness to a law that is summed up in four simple words, “Slow Down, Move Over,” and at the end of the day it’s about saving first responders’ lives. 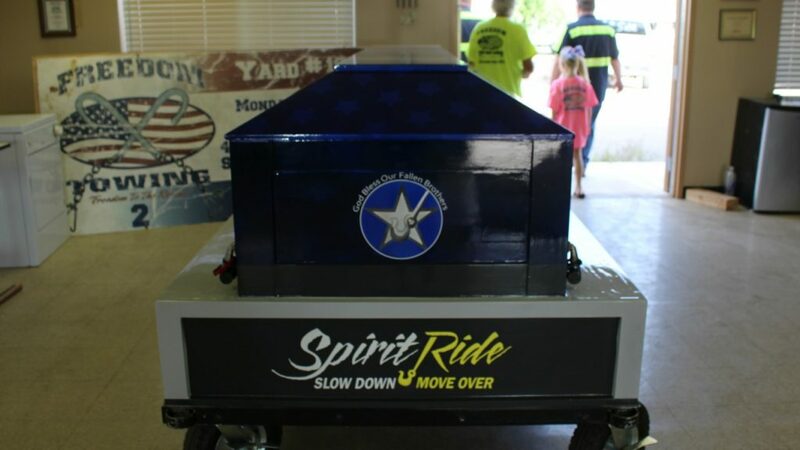 The Spirit Ride, sponsored by American Towman, started in June 2017. Since then, the grassroots awareness campaign has crisscrossed the country. By the time it finishes this year, organizers say it will have visited more than 300 cities, accompanied by escorts totaling some 10,000 vehicles, including tow trucks, fire trucks, ambulances and police vehicles. For Cameron Kent, towing operator for Great West Towing, the movement has his full support because he “wants to go home to his family at night,” a family that includes his girlfriend and four children. 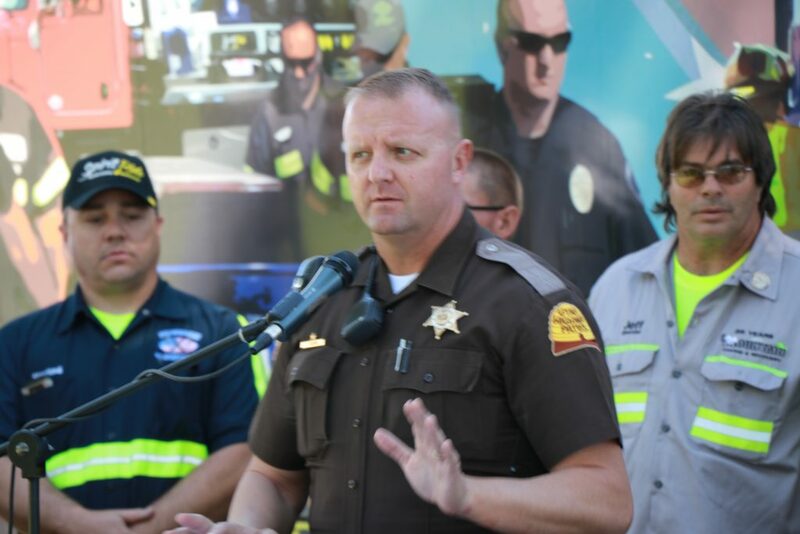 The risk of injury or death is enhanced when responders are working along highways or interstates where speed limits are significantly higher, Utah Highway Patrol Sgt. Larry Mower said. Troopers are often confronted with vehicles “flying by you at more than 80 mph, just a few feet away from where you are working. 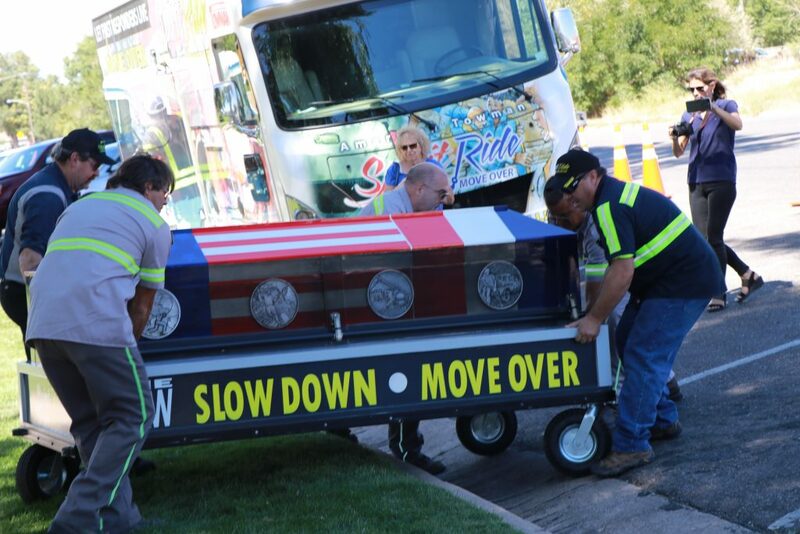 Aside from the danger, moving over is the law in Utah, which requires drivers approaching stationary emergency, highway maintenance or towing vehicles displaying flashing red, blue, white or amber lights to slow down, provide as much space as possible, then move over a lane if it’s safe to do so. 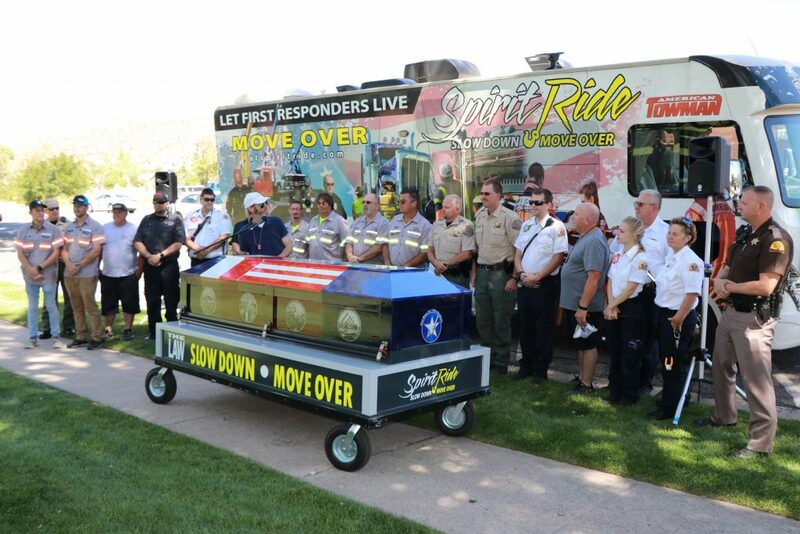 The casket then made its way to Cedar City and was showcased during a short ceremony Friday afternoon, where tow truck operators joined representatives from Iron County Sheriff’s Office, Gold Cross Ambulance and Utah Highway Patrol in welcoming the Spirit Ride to town. A one-hour ceremony was held in the city’s Main Street Park. 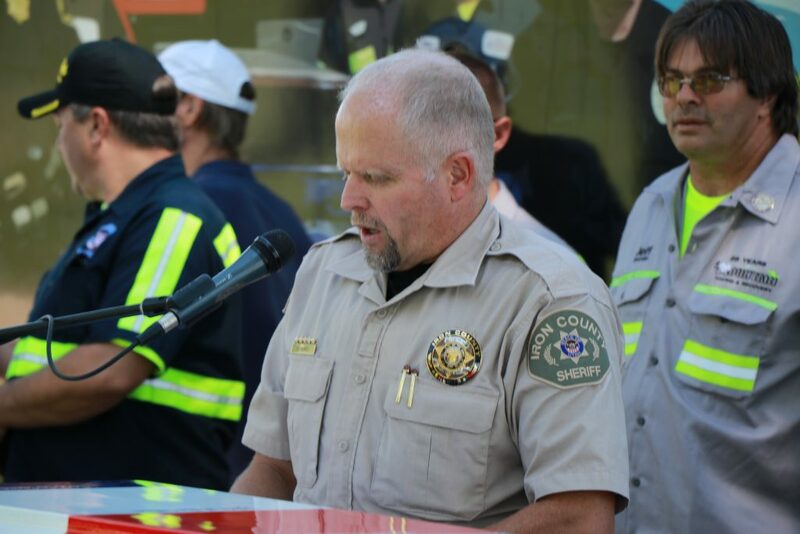 Wayne Hall, owner-operator of Mountain Towing and Recovery in Cedar City, and employee Jeff Rexrode both recalled a close call of their own in March, when a semitractor slid on the icy interstate and slammed into a tow truck, which then struck Utah Highway Patrol Trooper Daniel Nielson’s patrol vehicle. Fortunately, all of the people in or near the vehicles were able to flee to safety mere seconds after Hall had yelled “Run!” to warn them of the approaching truck. 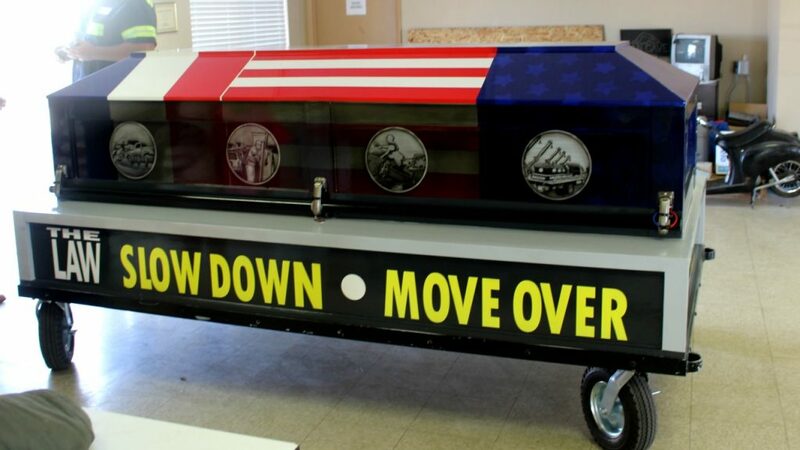 Although Nielson didn’t refer specifically to that particular close call during his brief remarks, he did stress the importance of the Move Over law, which he noted is now a law in all 50 states. 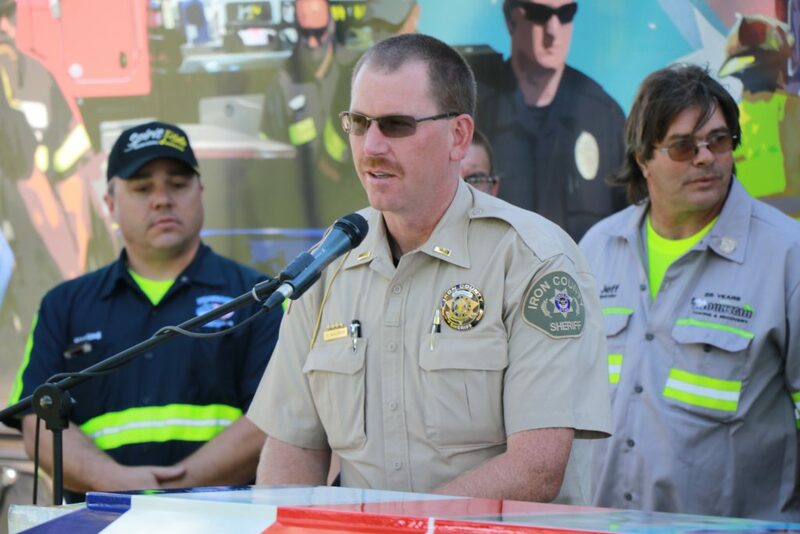 Spirit Ride organizer and spokesman Mike Corbin said motorists who fail to obey this law put many lives at risk. 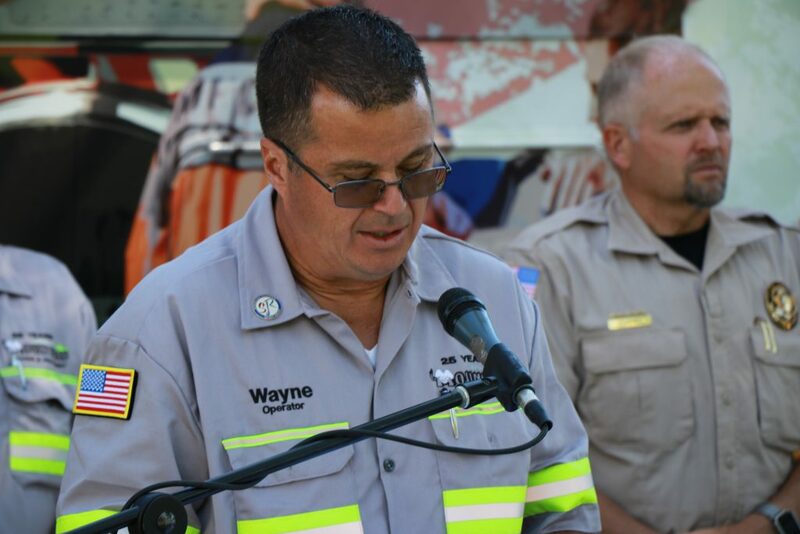 “Hundreds of casualties a year are the result of cars and trucks passing too close, only inches from where work is being done on the shoulders of closed-off lanes,” he said, noting that in addition to police, fire and emergency responders, other workers are often being struck, including tow truck operators and utility, transportation and sanitation workers. 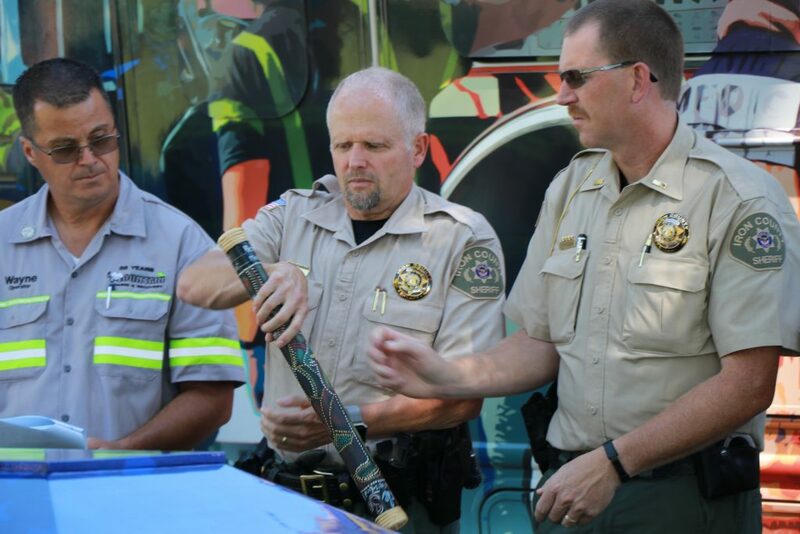 “On average, there are 100 fatalities annually,” Corbin said. 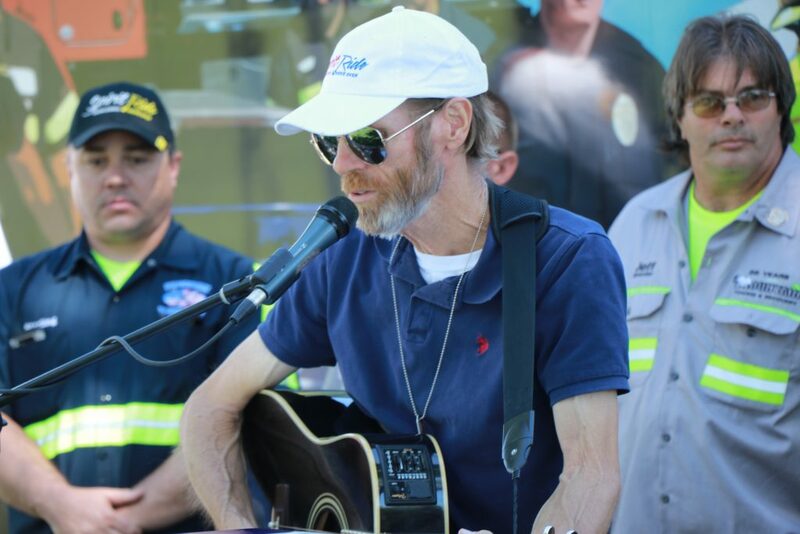 Corbin also sang a couple songs during the program that paid tribute to responders who’ve lost their lives and passed along a ceremonial baton that he said served as a reminder to respect the danger or peril they’re placed in, and to make it home safely each night. 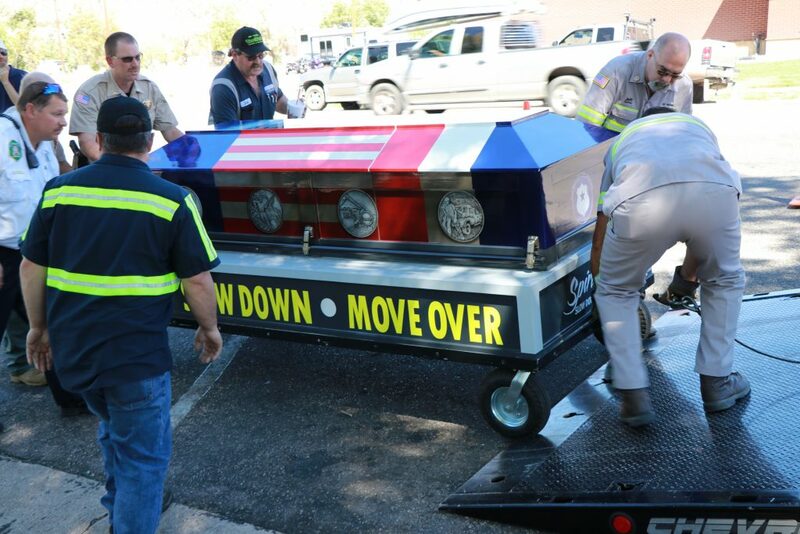 At the conclusion of the program, Hall and his employees loaded the casket onto the back of one of the company’s tow trucks and took it for a ceremonial ride around the city, after which it was scheduled to return to St. George, and from there, head toward Las Vegas. 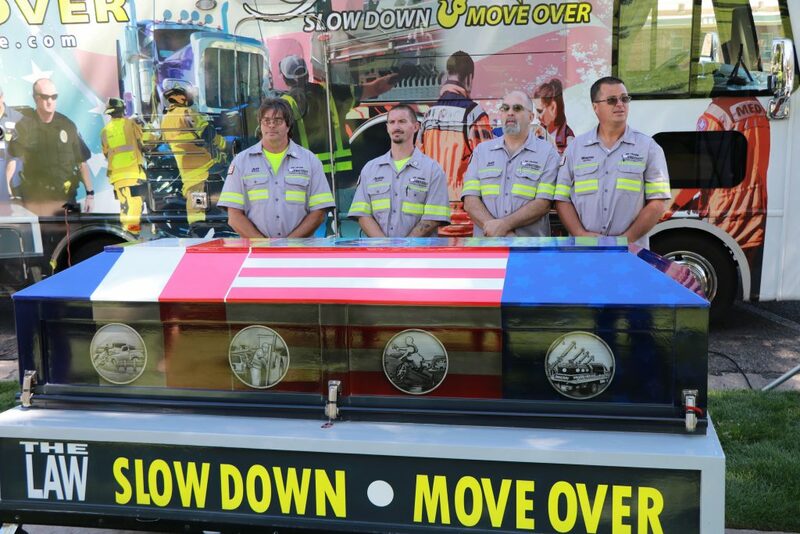 All 50 states have enacted “Move Over” laws, yet surprisingly, less than 30 percent of Americans are aware these laws exist, according to the National Highway Transportation Safety Administration. Even so, ignorance of the law can have deadly consequences. 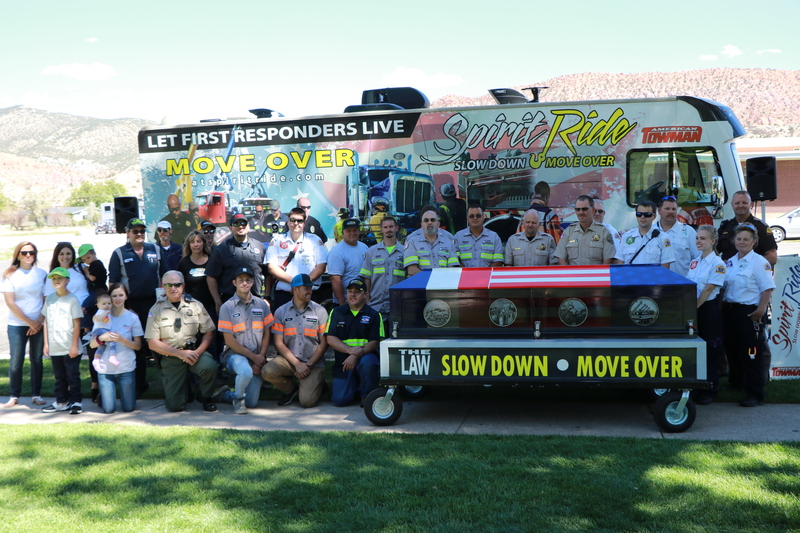 The number of tow truck operators killed each year is alarming, and for them, working on the side of the road can be even more deadly as they must be in front of the situation, so they cannot see what might be coming from behind. 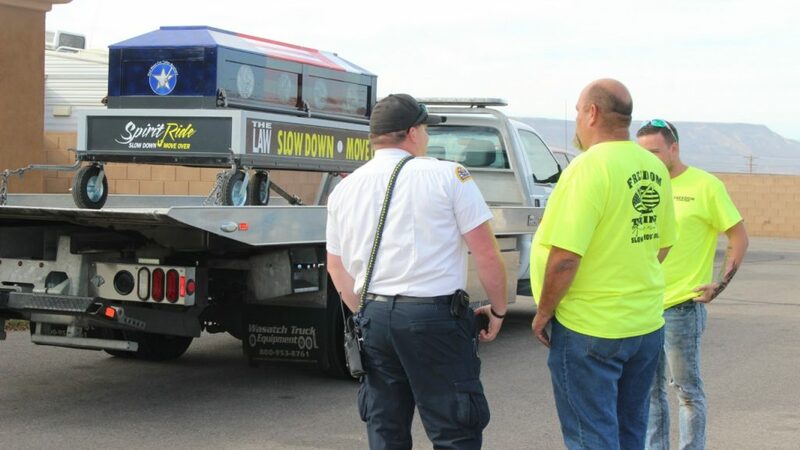 On average, a tow truck operator is killed on the job every six days in the United States, and one law enforcement officer’s life is lost each month. Further, five firefighters are killed each year in the U.S. while working along the nation’s roadways. To follow the Spirit Ride’s progress on its cross-country journey go to the organization’s Facebook page. Cedar City News reporter JEFF RICHARDS contributed to this report.